Dimensions, the corporate uniform supplier, raised £27,800 for charitable causes in 2018. 2018 saw cake sales, quizzes, raffles, staff car washes, auctions and dress down days, among other activities, contribute towards the overall total of almost £28,000. But the big charitable event of the year was the Lyke Wake Walk, a 40-mile trek across Yorkshire moorland, which 36 intrepid employees took on the challenge of completing in just 24 hours, last June. On what turned out to be one of the hottest days of the year, the Dimensions team smashed the challenge, making it a massive success, with tens of thousands of pounds raised for good causes. The overall fund was split between international, national and local charitable causes, allowing for employees to vote for the charity they wished to be presented with the fund. Cancer Research UK and Macmillan Cancer Support were equally split for the national fund, while the international section, saw the Glory Bandhu Protim Samaj Kallayan Sangstha School, in Dhaka, Bangladesh chosen. The school has a special meaning for a lot of staff, as Bangladesh is a major producer of Dimensions’ uniforms, with many employees having visited the school in the past. With £5,300 earmarked for local causes, staff voted for the University Hospitals of Derby and Burton NHS Foundation Trust, University Hospitals of Leicester NHS Trust and Nottingham University Hospitals NHS Trust, to receive the fund. 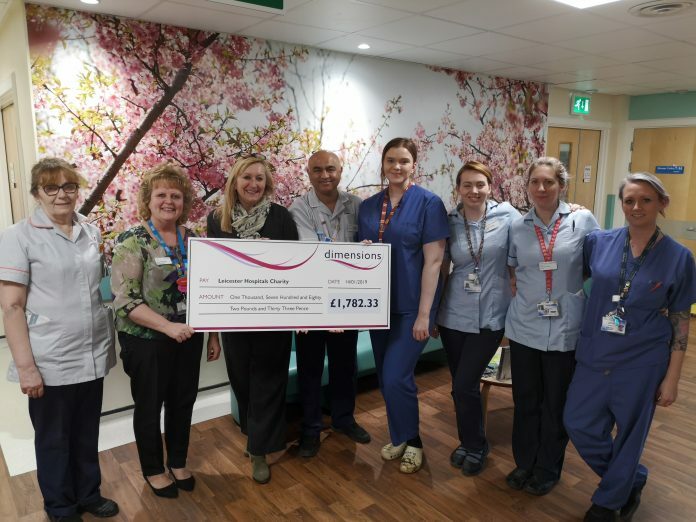 This meant that the Neonatal Intensive Care Unit at each hospital, saw a donation of £1,782.33 presented to them earlier this year, with visits from Dimensions to each unit, to see how they were planning to utilise their donation. Midwifery Matron at the Leicester Royal Infirmary, Joan Morrissey, said: “We had 48 midwives trained on an Aromatherapy course, and this donation will allow us to buy essential oils for them to use, which costs £850 a year. Lorraine Collins, Neonatal Unit Ward Sister at Nottingham Children’s Hospital, said: “Every penny of this money will help the department across the year. Dimensions Managing Director, Hayley Brooks, said: “Charity is an important part of what we do at Dimensions, with a lot of annual activities planned. “It is crucial for businesses to support their local communities, and I’m delighted we are also able to help important causes that affect so many, like Cancer Research UK and Macmillan Cancer Support. “2018 additionally saw us support a local school in Bangladesh, which was very rewarding, as we like to support communities both in the UK and overseas. Dimensions has also revealed its new charities for 2019, with the annual vote finding three fantastic causes for the team to support. Homeless charity, Doorways Derby has been confirmed as the regional charity, as they look to provide food to the city’s less fortunate, while nationally, mental health resource Mind, are set to benefit from the team’s support. Globally, Save the Children will also be receiving donations as a result of another year’s fundraising.